” President Donald Trump’s Week 11 in Office – April 3 – 7, 2017 – Need for Redefining Governance Model ” – April 7, 2017. 1. Attorney General Jeff Sessions had ordered a review of Federal agreements with thousands of law enforcement agencies including those that address abuses. This examination reflecting President Donald Trump’s emphasis on law and order; and reducing violent crime could lead to a further retreat on consent decrees nationwide. 2. President Addel Fatah el-Sisi of Egypt is emboldened by President Donald Trump’s validation. Former President Barack Obama had a different equation with the leader of Egypt. 3. Stephen K Bannon has been removed from National Security Council. NSA, Lt Gen HR McMaster’s imprint is solid, strong, and stable. 4. President Donald Trump describes his $ 1 trillion Infrastructure Bill as a High Value Legislative bill. 5. President Donald Trump defended Fox News’s Bill O’Reilly with words: “A Good Person” ; “I don’t think Bill did anything wrong”. 6. Possible changes to a program that allows tech companies to import foreign workers may be adding to an even heavier rush for visas than usual this year – it is felt. 7. US Citizenship and Immigration Services announced that “Entry level Computer Programming jobs” would no longer automatically qualify as a ‘Specialty Occupation’ which is a basic requirement for receiving H-1B Visa. Justice Department on Monday warned that it would look closely at any employer that showed a preference for H-1B workers instead of Americans. This comes just before the Government starts accepting applications for next year H-1B visas. Tech companies will likely face more scrutiny. Big companies like Google, FL may not be affected. 8. Devin Nunes, Donald Trump’s chief ally on the Congressional Committee investigating the President’s connections to Russia stepped aside from the inquiry, leaving the WH open to further attacks of the nature in future. 9. Neil M Gorsuch becomes the 113th Justice of the Supreme Court with his confirmation by the Senate today. “A feather in President Donald Trump’s cap” – who promised to appoint a Committed Conservative succeeding the deceased Antonio Scalia in February 2016. 10. North Korea tests a medium range ballistic missile reinforcing the American belief that it is a threat to be taken seriously with potential to strike the Foreign Policy Engagements. 11. 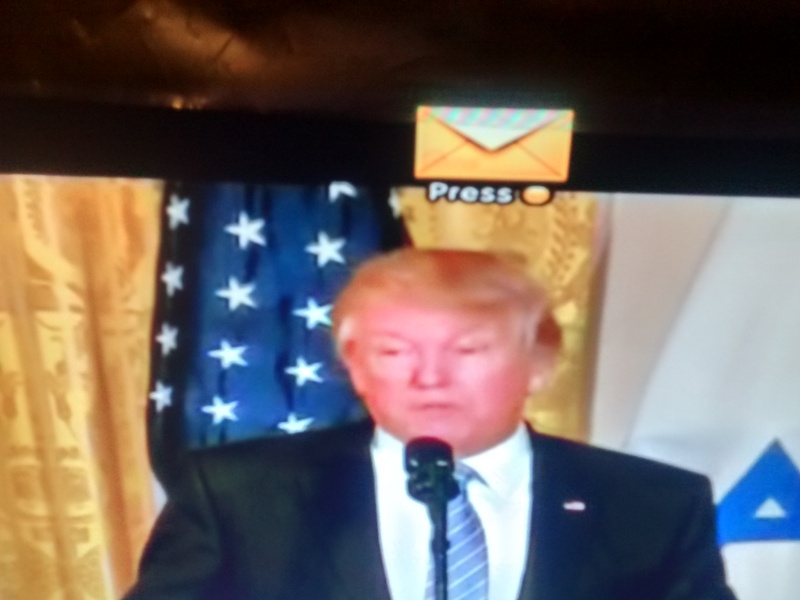 Expressing his deep felt sympathies to the victims of the Chemical Weapons attack in Syria, President Donald Trump said : “the death of innocent children, women, and little beautiful babies” (86 people including 27 children) makes him reassess the situation in Syria. It poses a foreign policy challenge to the President. 12. ” No child of God should ever suffer such horror” – said President Donald Trump and in a retaliatory measure authorized military and air strikes on Syria. 13. Israel supported the move recognizing in terms of a “strong message” sent in retaliation for the chemical attack – that Chemical Weapons will not be tolerated. 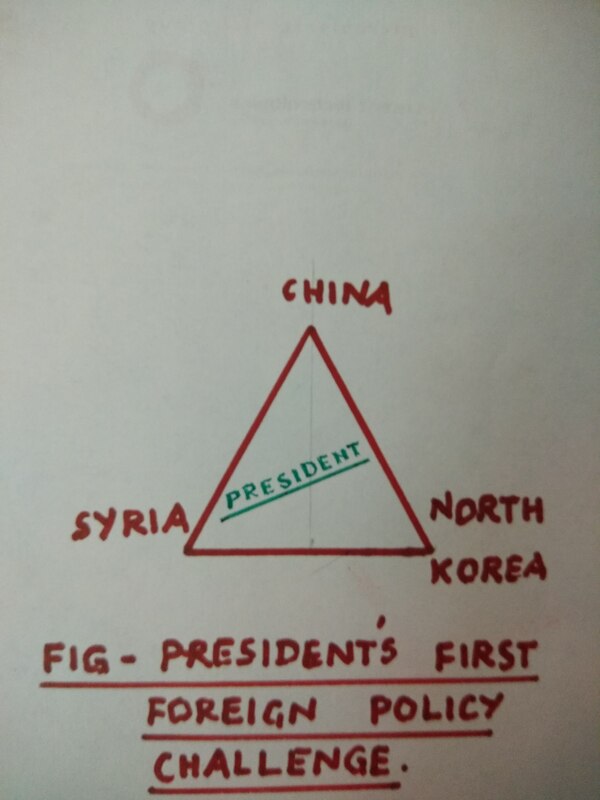 President Donald Trump’s political periegesis needs to mark a distinct path of Governance if he is to etch his stamp and to ‘position’ U.S.A’s role in the world at this critical juncture. visit in the light of President Donald Trump’s remarks with conviction during his election campaign on Trade Deal losses and Currency Manipulation maneuvers. It is only a week earlier the President affirmed the Construction Workers Unions – ” I’m not, and I do not want to be the President of the World; from now on it’s going to be ‘America First'”. The events mentioned above may not be construed as a distraction, but they definitely call for a shift in President Donald Trump’s positioning of U.S.A. as America First during his inaugural in January 2017 to a more perceptible focus on some “jarring global operations” constituting a New Governance Model. The Figure below presents the three elements of the New Governance Model. First, it begins with ‘repositioning U.S.A.’ possibly incorporating global involvement while ensuring the safety and security of America. Second, the President’s swift actions locally are transforming the way he infuses enthusiasm even though it excites and emboldens mostly his loyal constituency. It still makes his overall ‘people connection’ weak and suspect. It has to be enlarged and spread further to cover a majority of the population. If it is data that connects with customers in business, it is the sentiment and execution that connects people in politics. Accelerated program execution is a priority at this juncture. 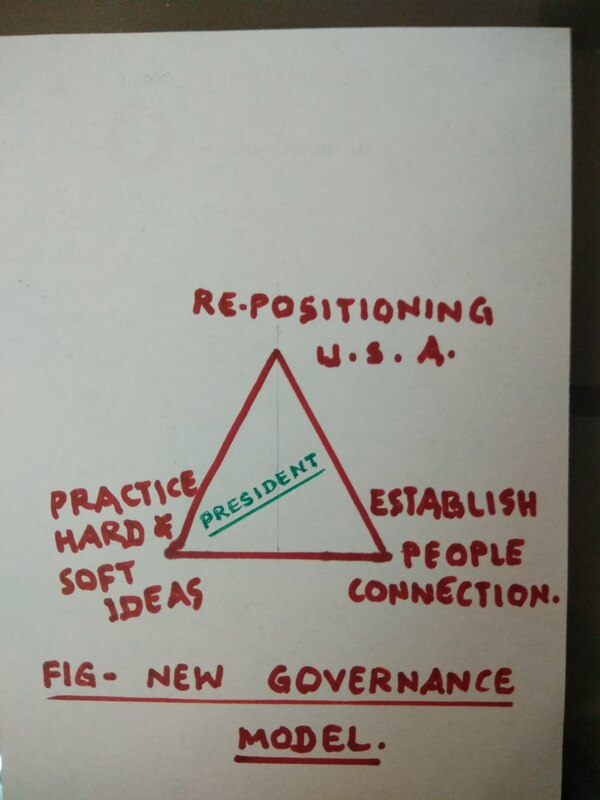 Third, the President needs a different formula to solve new challenges – a formula that will incorporate ‘hard and soft’; ‘strong and less strong’; ‘beneficial and sacrificial’ elements creating a new value to his ‘brand’ giving a more satisfying ‘Trumpesque’ experience to people. It means that he should promote big businesses even while encouraging small businesses/startups; he should promote coal, oil, and gas for energy independence even while encouraging renewable resources; he should promote stringent immigration control even while accepting those who spent long years contributing positively to the nation’s growth; and the likes. An obvious question that arises in this context is how this ideal can be achieved. Is there a proven ratio of the mix available based on past experiences or studies? Will a 60:40 or 70:30 ratio be the optimum? Can trials be formulated and worked in practice? Academicians and researchers will ponder. Final Inference : A singular but complex problem that will haunt any leader in program execution is ‘resistance to change’ which will force the leadership to work on enhancing trust and bridging the trust gap between the loyalists and common people who differ in their views. The best recourse for the leader under the circumstances is to engage in aggressive propaganda measures communicating the benefits of programs to people by the lawmakers in every constituency. I wish to recall in this context what the Indian PM said just a couple of months ago, and once earlier in 2015, that his “party legislators would do well not to sit and chat in the Parliamentary Hall in Delhi but go to their constituencies and communicate the brighter aspects of the Government’s programs to people”. He urged with command and most legislators pursued in all sincerity. The result was for all to see. Except for Delhi, Bihar, and just last month in Punjab his party virtually steamrolled the opposition in all elections since the leader’s own epic election in May 2014. This is the kind of change that the foreign leader needs to emulate now. 2018 is not far enough to ignore this aspect. I only believe that it’ll be quiet appropriate and the act sensible. This, perhaps, is the best tool in Democracy in the right place at this point in time particularly when challenges seem insurmountable and uncertain. Also when the leader engages in undoing and redoing things in a different way, as President Donald Trump attempts now. That the American people may not be surprised or shocked about their leader’s moves – since the leader has declamatorily poured these acts over and over during his election campaign even with time frames in some cases – is in itself a blessing from the point of view of Commonsense Management Principles of Governance. This aspect has to be further tested and discussed specially when deviation in courses of actions and even in Foreign Policy loom large now. President Donald Trump will be “Making New Rules for a New Order in this New Age” will be what most analysts and observers may anticipate.